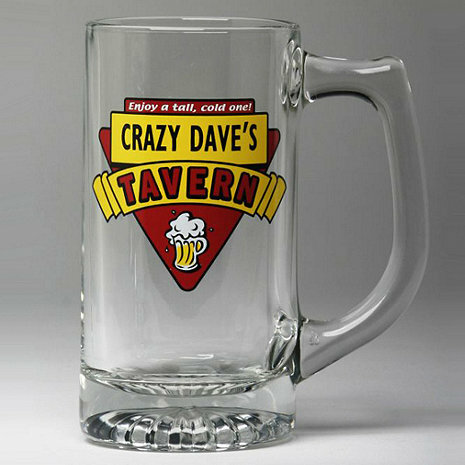 Your good name will always be associated with good brew, thanks to our personalized beer mugs with the eye-catching "Tavern" logo. Before friends pour a frosty serving, they'll be encouraged to "Enjoy a tall, cold one! ", the tagline above your tavern name. Brand yourself as the ultimate beermeister! Your good name will always be associated with good brew, thanks to our personalized beer mugs with the eye-catching "Tavern" logo. Before friends pour a frosty serving, they'll be encouraged to "Enjoy a tall, cold one! ", the tagline above your tavern name. Machine made of lead-free glass, decal contains some lead. Recommend to hand wash. Size: 5-5/8"H, 16 oz. ea.